This is not an ecological fable, though I assumed it might be from the title. 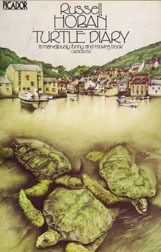 Instead, the main focus of Russell Hoban’s Turtle Diary, published in 1975, is on lives of quiet desperation and loneliness, and in particular of two people whose lives intersect for a while because they share a compulsion to release the loggerhead turtles in London Zoo into the wild. William G. works in a bookstore and lives alone in an apartment, haunted by thoughts of the family he’s been separated from by divorce. Neaera H. is the author of children’s books, single, tired of writing books about cuddly animals and resigned to her aloneness: ‘My despair has long since been ground up fine and is no more than the daily salt and pepper of my life’. Could I be a turtle? Could I through an act of ecstasy swim unafraid and never lost, finding, finding? …A turtle doesn’t have to decide every morning whether to keep on bothering, it just carries on. Maybe that’s why man kills everything: envy. I’m always afraid of being lost, the secret navigational art of turtles seems a sacred thing to me. My generation was somewhat between things, neither free nor much supported by whatever held us in. Its in jus letting your self be where it is. The longest and most spectacular animal migrations are made by young loggerhead turtles. They travel for a period of years along migratory routes that span entire oceans. Young loggerheads in the North Atlantic cover more than 9,000 miles to their mating grounds before returning to the North American coast. Those in the Pacific travel even farther.